Also, today I will be giving a (hopefully quite) short talk entitled “Nuclear Luminosity: The Fabulous Metahistorical Textuality of Thomas Pynchon’s Mason & Dixon” for the Univ. 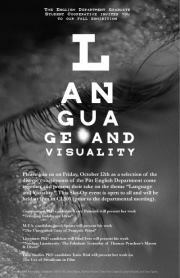 of Pittsburgh English Grad Student Scholarship Collective Fall Symposium, Language & Visuality. The event will be taking place in CL 501 @ 1pm. In addition, Kerry Banazek-PhD in Comp/Rhet, Jacob Spears-MFA, and Katie Bird-Phd in Film will be speaking.